Milldene is a traditional Broads cabin on the North East riverbank of the River Thurne at Potter Heigham.. 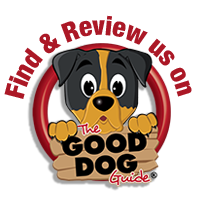 It provides clean and comfortable accommodation for up to 8 people and flexible dog numbers. From the cabin you can walk inland along miles of road free marshland footpaths and of course you can hire Misty the Day Boat from the owner for the week, moor it up in front of the cabin and use it to explore the Broads. Hickling Broad, Horsey and Ludham are a short cruise away and much of the Broads National Park network is accessible from here. The cottage is traditionally let out for fishing (seasonal) but the owner loves her peaceful cabin and would love to see it enjoyed by dogs and their owners . Potter Heigham broads village has a pub, shops and cafes and boat hire yard. When you get here: Access to the cabin is along a short and easy footpath behind the other cabins but there is no road access (so no passing traffic bar boats and ducks!). The property is surrounded on 3 sides by a wooden paling fence which tails down as it gets to the waters’ edge where there is no fence to the open river. There is a simple grass area with picnic bench seating in front with views across the river to the open marshes and the quay heading on which you can moor a boat if you want to hire one for the week. Entrance from the front door into the …. Living/Dining room: Comfortable seating for eight including sofa bed, rugs and throws, dining table and a tv with Freeview and dining seating area and including the open plan kitchen area with cooker, microwave, dishwasher, washing machine and great views across the marshland and river. Off this is the …..
Twin bedroom: Bunkbeds, great to lie on and watch the early morning river life out of the window. Clothes storage. Shower-room: Toilet, sink and seperate electric shower. Given the waterside location and construction of the building winter bookings may not be for the fainthearted! Why not hire Misty the Day Boat and get the most from your Broadland Holiday. You will be met on arrival and with your luggage you will be taken to Milldene. The boat is Broads Authority approved, properly certified and insured and life jackets will be provided. The boat can be hired for use during your stay from £200 a week for 7 people. Please contact the owner of Milldene, Jan Withers, 07535 125448 or janwithers@icloud.com. Parking is available at The Old Bridge Hotel between the Old Bridge and the fish and chip shop. Permits can be purchased on the day of arrival (£10 – £33/week depending on time of year). Potter Heigham is off the A149, between Stalham and Acle. What a great stay, Jan you were so helpful and kind. Thanks for the milk, cake, towels etc. and setting everything we could possibly need up! We came with our 5 week baby so that was beyond helpful! I came to the broads for a holiday as a kid so this has been a great trip down memory lane and Fred (our baby) had his first boat trip! Thanks again, everything was so clean and organised too – much appreciated. What a wonderful welcome we received and a very special boat trip to Hickling Broad, such a special place! Fabulous weather, even the thunderstorm was spectacular. The dogs were in their element both on the broads and in the sea at Winterton as well as the dunes! Thank you so much and hope to come again soon! Milldene! How lovely! Thank you so much for allowing us to share your bungalow for a week. We've had such a restful, peaceful time it really has been wonderful! After spending the last 3 and a half years as a Landlord and Landlady of a pub in Braintree - with no time off - this holiday came as a very welcome start to our retirement. Hopefully we will be back. Had a wonderful week here! Milldene is very clean and comfortable. It had everything we needed. My sister and brother in law joined us during the week and loved it! It is very dog friendly and Jan kindly left us dog treats and towels for Gracie and tea cakes and home made jam for us. Very welcoming, thank you. We will definitely be back. Had a fab two weeks here as usual. Lovely to sit outside with the new chairs. Milldene is lovely as always and weather was great. Thank you. Had a wonderful time, perfect location. Very clean accomodation and very pleasant and kind owners. Thank you, we will be back!